A Sabellastarte species (right) and another species of feather duster (left). Image by Ryan Shelander/A&M Aquatics. 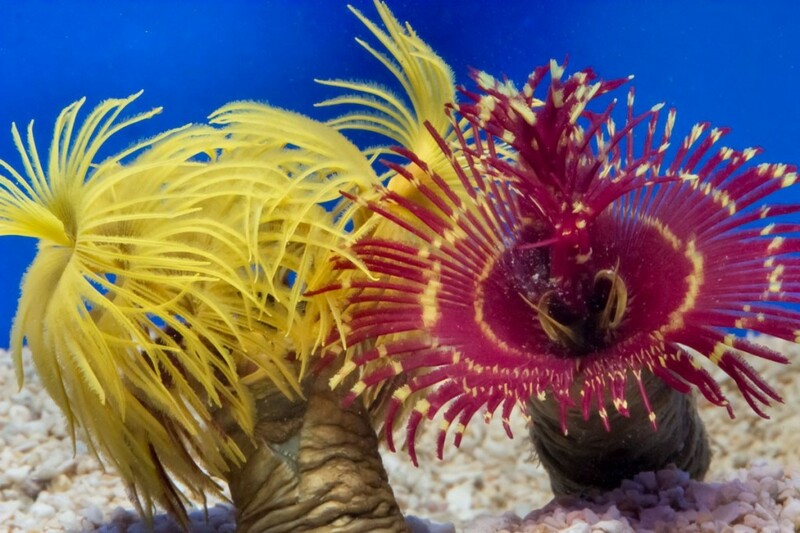 Editor: This is Dr.Ron Shimek’s note about a image of feather dusters that recently arrived at A&M Aquatics in Lansing, Michigan, and were photographed by Ryan Shelander for a Rarities piece in the current issue of CORAL. Brian Wagner, also of A&M says these flamboyant worms are coming from Cebu, a busy collection center in the Philippines. After examining the latest paper I could find on the Sabellastarte (Knight-Jones&Mackie, 2003), the red-crowned species is probably a Sabellastarte, and if so, the only species whose distribution includes Cebu is Sabellastarte spectabilis. The spiral arrangement of the feeding crown on the yellow species indicates it is some other sabellid genus, perhaps, Bispira, but there are a couple others that it could be as well and without the specimens for examination, the determination of the species is impossible..
As regards feeding in feather dusters, it is now easier than it was ten or more years ago, in the sense that there are a lot of relatively good food sources around. However, it never really has been hard to feed these worms, it just takes a LOT of phytoplankton, and hobbyists are generally loathe to buy as much as they need and even more they are loathe to feed it in the rather awesome amounts necessary. These large feather dusters are not generally animals from clear water areas. They most often live in green or turbid water with a lot of phytoplankton floating in it. They need to be in an aquarium that has a very evident green tint when viewed from a couple of feet away. I’d suggest that keeping them in a nanotank of a few gallons where the water can be “greened-up” daily or more frequently is probably the only way they will get enough food to survive. 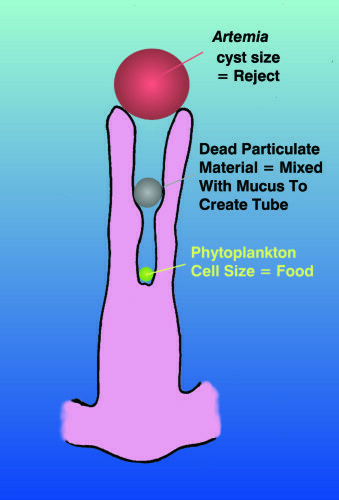 They filter the available food or those particles that get caught in the mucus of the feeding tentacles. Here I have a simple diagram of a cross section through one of the fine tentacle branches, or radiole, showing the “V”-shaped upper surface of the branch, and showing how food sorting by size is done. All of the particles are in a mucous layer and together with the morphology of the tentacle branch partitions, the particulate resource is sorted by size alone. The composition of the particles doesn’t matter for feeding, they pretty much eat everything of the right size, but normally where the animals thrive, the only very tiny particles are phytoplankton. Knight-Jones, P., and A. Mackie. 2003. A revision of Sabellastarte(Polychaeta: Sabellidae). Journal of Natural History 37: 2269-2301. What do you think of carbon dosing, such as vodka, with these animals? 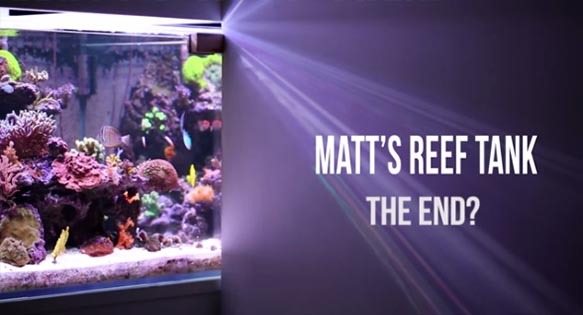 I have noticed many people on reef forums say that feather duster populations “explode” with they start dosing and I have noticed the same in my tank although I have not tired the traditionally hard to keep species. The hitchhiker type has really done well in my carbon dosed system and I have had a couple of “giant feather dusters” also do well for over a year now. Perhaps it is a way to feed them, or at least supplement the traditional reef diet in a way that does not pollute the system? I was going to ask the exact question as above poster…. I too have had explosions after bio pellets. The answer to your question is, as you imply, really straight forward. Adding your favorite booze to the tank stimulates the bacterial growth, and the smaller feather dusters that do well in an aquarium probably need to eat particulate material about the size of those bacteria. Possibly they cannot feed on particulate material of “phytoplankton-size”. That your big guys do well indicates that they can also gather bacterial particulate, which is a good thing to know. Some years back, I was keeping a low-light tropical tank with some deep-water gorgonians. I was having some trouble with providing them with enough food (this was well before the dosing regimen had become known). I cut back on my skimming and other filtration, with the hope of building up a population of water-borne bacteria. The small feather duster population soon also “exploded”. I attributed that to the bacterial bloom that seemed to be occurring in the tank, so I think these small feather dusters need bacterial-sized particulate food. It is good to remember in all of these cases, that the worms are not making any choices with regard to food. They neither like or dislike the foods. They have no choice in what they eat. Their bodies are constructed that they automatically filter out the proper sized particulate material. So, if there are particles of the appropriate size in the water, they will filter and ingest them, be they bacteria, very small algae, plastic beads, or inorganic debris. I was going to ask the exact question as above poster.... I too have had explosions after bio pellets. What do you think of carbon dosing, such as vodka, with these animals? I have noticed many people on reef forums say that feather duster populations "explode" with they start dosing and I have noticed the same in my tank although I have not tired the traditionally hard to keep species. The hitchhiker type has really done well in my carbon dosed system and I have had a couple of "giant feather dusters" also do well for over a year now. Perhaps it is a way to feed them, or at least supplement the traditional reef diet in a way that does not pollute the system?